George Matus has been building drones since he was 11 years old. At 18, he has built the world’s fastest production drone, Teal. The 730 gram craft will be able to takeoff at 70mph and has hit speeds of close to 85mph in testing. Drone racing is taking off (literally), and Matus wants to be on the forefront of the consumerization of drone technology. Besides being fast, his new drone will have access to an app store, just like your iPhone. Out of the box, the drone will have three initial applications. The drone has a follow-me mode that can follow people, cars, and other objects. Users will be able to race against other Teal flyers, on set courses, against a leaderboard, using image recognition developed by Neurala. The basic flight mode comes with some pretty advanced features as well. The Teal team is coding in some flight specs so that if you want to do advanced moves, like flipping the drone, you only have to push a button. Teal can also record 4K video, live stream at 720p, and take 13MP photos. Matus hopes to build an active developer community as he competes with other drones on the market, like those from DJI. Not to be missed, the drone is twice as fast as the DJI Phantom 4, charges significantly faster, and is $100 less expensive. The $1,299 drone will come standard with two batteries that will allow for 10 minutes of flight time each. That may seem limiting, but everything about this drone is fast. The on-board battery will charge in 30 minutes, and the first 500 orders will get the Endurance Package with their drone that hosts a battery that will allow for 20 minutes of flight time. Delivery of the Teal is set to occur in time for the holidays for the first batch of orders and everyone else will have access to the blazing fast drone early next year. Despite the cost-premium on production, all drones are going to be produced in the United States. 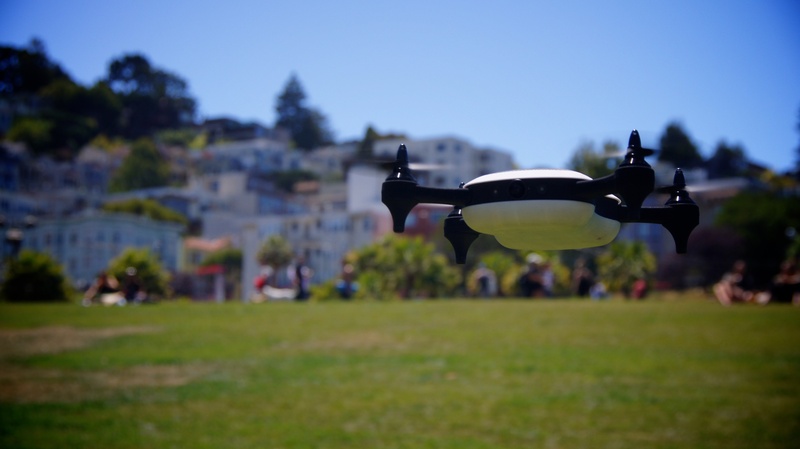 TechCrunch got to watch this drone in the wild – flying over the unknowing eyes of onlookers at Mission Dolores Park. The first thing we noticed about the craft is its size. The drone is light and feels sturdy to hold. All parts on the drone are fully replaceable incase a propeller gets damaged in a high-speed collision. The drone is also incredibly stable. While I did not fly the drone personally, in tests it maintained very stable flight despite wind. We are looking forward to putting this drone through the paces when we get our hands on one. Teal comes just in time for updated FAA regulations on recreational drone flight. Flyers will need to complete a simple registration but will be able to fly up to 400 feet in the air as long as the drone is within their line of sight. Teal already includes geo-fencing features to avoid flying over sensitive and prohibited locations. Matus is also a Thiel Fellow, Peter Thiel’s program for young people with great minds. The program gives creatives $100,000 in exchange for full-time pursuit of an idea, outside of college. He credits the program for helping him transition into a founder role. Against Fellowship recommendations, Matus kept his company in Salt Lake City, Utah. The wide-open spaces of the state support the company as it continues to test new designs. Fellows are strongly advised locate their companies in Silicon Valley to give them the greatest exposure to the Thiel network. Any team making a drone this fast has to be just a little crazy. That passion for flight comes through perfectly in the experimental flights that have occurred at Teal over the last few months. At one point Matus affixed a toilet paper roll to the body of the craft and attempted to “TP” various objects at high-speed. We fully expect Matus to roll out an interplanetary drone by 28. TPing things at 25,000 mph escape velocity would be fun too.